JOHNGY'S BEAT: Roddy Piper is My Guy! Roddy Piper is My Guy! 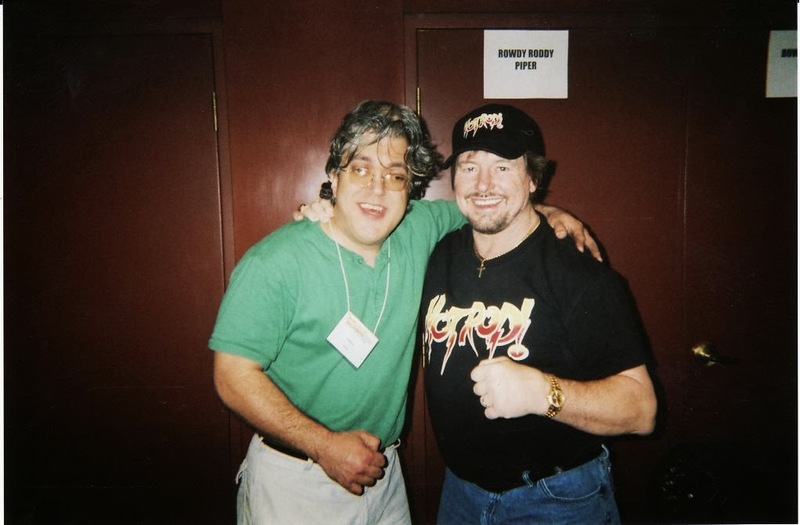 I have met Rowdy Roddy Piper several times. Each time is a new experience. It's always good, but it is never the same. Roddy can talk wrestling all night long, but he can also talk about pretty much anything. The man has done and seen it all. It is a virtual guarantee that no matter the subject, Roddy will entertain you. Roddy has accomplished a lot, especially for someone who had a bit of a rough upbringing and fought his own literacy problems. I learned a lot about Roddy from his book and from my interview with him. In that interview, I encouraged him to write another book, because his book was just too short. For a person with as much to tell as Roddy, his book just did not tell enough. What's in there is great. It just needed more. I have not seen Roddy yet this year, but I am hoping he pops up at one of the conventions. Maybe we can even talk more about his next book! Roddy Piper and me in Indianapolis, IN-July 2011.